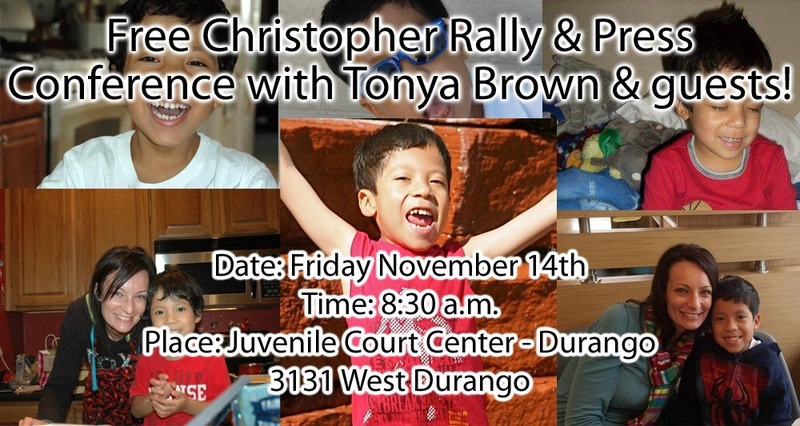 Free Christopher Rally & Press Conference in Phoenix with Tonya Brown & Guests! Phoenix Children's Hospital and DCS seized custody of Christopher Reign Brown on June 25, 2013, taking custody away from his legal mother, Tonya Brown. Tonya and family members claim this was a "medical kidnap" simply because they disagreed with doctors and wanted to seek other options for his dangerous cancer treatment, a bone marrow transplant with no family member donor. Full Story here. Tonya has a court hearing in Family Court on Friday November 11th. This court hearing could sever her relationship to her son permanently. Advocates for the family have organized a rally for the family at the Court House. Is there an update to this? What was the outcome of the hearing? SHARED "Dr. Jessica Boklan considers herself, per her testimony in court, to be the world’s leading authority on CML leukemia. She has an impressive resume of research studies that she has co-authored or is participating in at present, most involving children, cancer, and drugs. From the beginning of Christopher's diagnosis, Dr. Boklan has pushed Tonya to enter Christopher into a research study. Christopher improved with alternative in-home treatments for 18 months before CPS kidnapped him. Now that Christopher is a ward of the state, the doctor is free to do medical research on him without his mother’s knowledge or consent." "The cancer industry in the U.S. is one of the most lucrative medical markets, with one 1 of every 3 people in the U.S. expected to have a cancer diagnosis within their lifetime. It is a multi-billion dollar industry, and one that just cannot afford a 'cure for cancer' that would put hundreds of thousands of people out of work. Hence, any alternative to the “approved” FDA drugs is vigorously attacked and opposed." We can't let this happen. In reading the story I can see that part of this is going after Christian parents for their faith.